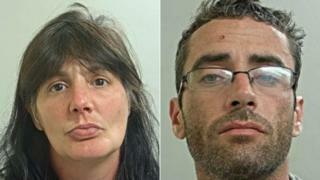 A man and a woman who beat and stabbed a man before setting him on fire have been jailed for life for his murder. Deborah Andrews and William Vaill, of Skelmersdale, attacked Eamon Brady before covering him with a quilt they then set alight in July 2018. They went on to sell the 44-year-old's belongings, including a games console. Andrews, 44, and Vaill, 37, were ordered to serve a minimum of 28 years and 28 years six months respectively at Preston Crown Court. Mr Brady's body was discovered by firefighters who were called to a flat in Elmridge, Skelmersdale, at about 07:30 GMT on 21 July 2018. Lancashire Police said Andrews and Vaill were caught on CCTV leaving the flat earlier, at about 04:50 GMT, with a bag. They were arrested shortly after Mr Brady's body was found. A post-mortem examination found he had suffered multiple head injuries, a number of stab wounds to his upper body and neck and significant injuries to his lower body from the fire. Vaill pleaded guilty to murder and arson with intent to endanger life at an earlier hearing, while Andrews was convicted after a trial. Speaking after the hearing, Det Supt Claire McEnery said the pair "launched a vicious and prolonged attack causing numerous, horrific injuries to Mr Brady which proved fatal". "Vaill and Andrews are clearly extremely dangerous offenders and today's prison sentences reflect the gravity of their actions," she added.